How can 3D printing help those with paralyzed limbs? On this page we’ve shown you many different forms of prosthesis created thanks to 3D printing that has changed the lives of many people with missing limbs. 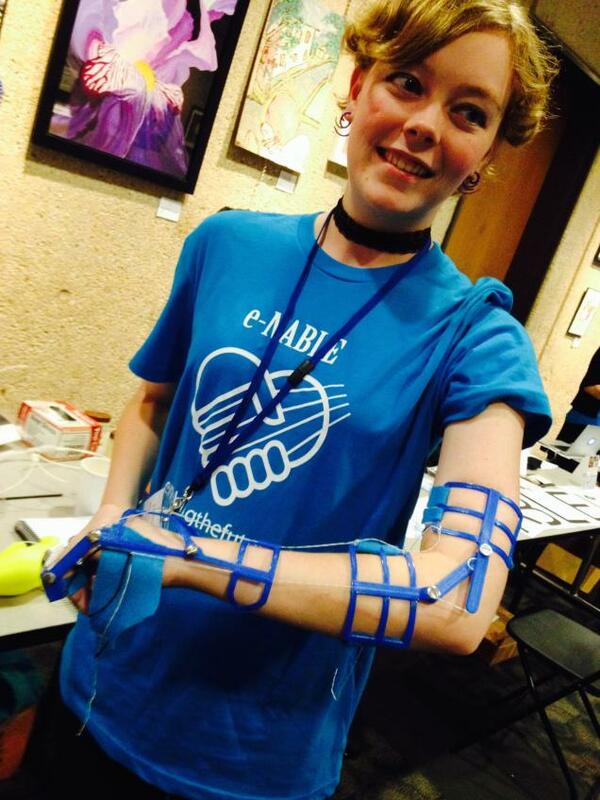 We have seen many extremely helpful 3D printed prosthetic hands and arms come to fruition over the past two years. Thanks to groups like e-NABLE and the Robohand Project, there are hundreds of people who now have gained use of both of their hands. The incredible thing about 3D printing is that it allows for the fabrication of completely custom devices, at costs of under $50. Traditional prosthesis cost up to 10,000 times this price, and many of these expensive devices don’t even function as well as their cheaper, home-fabricated counterparts. 3D printed prosthetic hands have been a life saver for individuals (mainly children) who have been born with missing hands, or partial hands. These devices allow them to gain use of an appendage that they never had the ability to use before. With this said, what about those individuals who have their entire arms and hands intact, but for one reason or another don’t have the ability to move them? There are many medical issues that can cause paralysis of a limb and/or appendage. They range from muscular dystrophy, to arthritis, strokes, nerve damage, and in this particular case a child who was forced to have a hemispherectomy (removal of half of their brain). Devices to help aid these people are not all that common, and if one were to get their hands on such a device, it could cost upwards of $50,000. This is where one young lady, named Elizabeth Jackson comes to the rescue, thanks in part to 3D printing technology. Jackson, a member of e-NABLE, and a student of e-NABLE’s “leader”, Jon Schull at RIT(Rochester Institute of Technology), decided that something needed to be created for those without functioning arms/hands. Building on previous work by fellow e-NABLErs Ivan Owen (University of Washington Bothell) and Jean Peck (Creighton University, Omaha), Jackson came up with what she calls the “Airy Arm”. 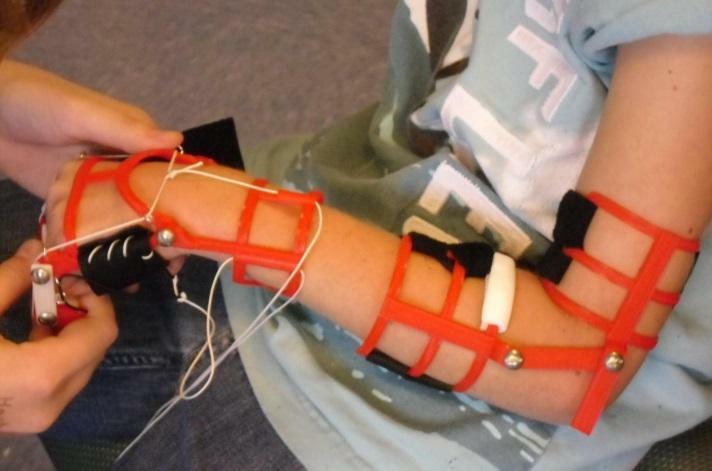 The device works with cables that run over and under the fingers and then attach to the elbow. The hinge, located on the elbow, pulls on the cables under the finger and then forces the hand to close, as the elbow bends. When the elbow is straightened, the inside of the elbow pulls the strings located on the back of the fingers, thus opening the hand. This means that when the user reaches for an object, the strings pull the fingers open, and when the user pulls that object back toward his/her body, the fingers are forced to close. A double hinge on the elbow allows the user to have free movement without any interference or irritation of the skin. The underside of the fingers are strung with elastic, which enables the user to hold objects of different sizes, quite comfortably and confidently. There is so much potential for devices like this. Just imagine how many people would love to have such an apparatus enabling them to once again gain use of both hands. Jackson will be working for the Brain Recovery Project, starting in January, in an attempt to create a final design for this device, and get it working for several patients who they work with. The Brain Recovery Project works with children who have experienced severe epilepsy, and were required to have half of their brain either removed or disabled. These children become paralyzed on the opposite side of the body that their brain was removed from, and devices like what Jackson has come up with can help them regain function once again. If you are interested in donating to the Brain Recovery Project, you can do so on their website. 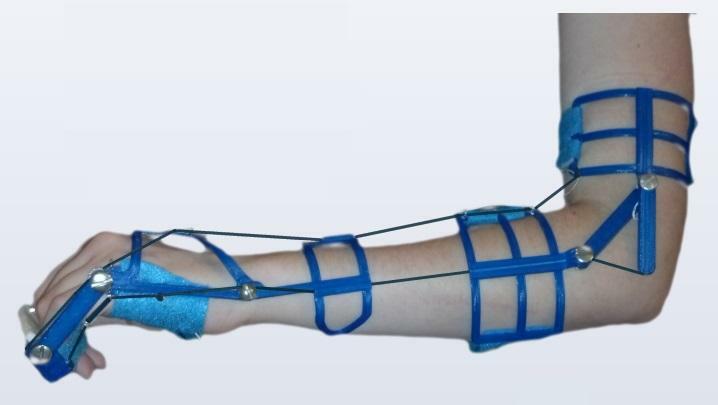 If all goes as planned, then perhaps one day soon, anyone will be able to print their own Airy Arm for personal use, or for use by family and friends. This is why 3D printing is such a great tool. It allows for open source designs that are able to be fabricated via downloadable files. What do you think? Will this device provide as much of an aid to users as some of the 3D printed prosthetic hands we have seen? Discuss in the Airy Arm forum thread on 3DPB.com.